Crisp autumn air. A bright blue sky. And a heart-healthy walk along the sparkling Susquehanna River. How lucky are we to live in such a beautiful district and state? 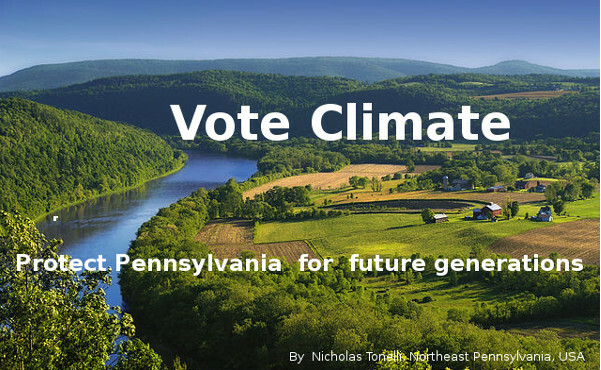 Every time you vote, you have an opportunity to let the candidates know you want them to act on climate change and protect Pennsylvania's environment. Our Congressional representatives can act on climate. We’re a nonpartisan group who’ll keep you informed of upcoming 13th Congressional district elections. We’ll let you know where the candidates stand on climate, so you can cast a vote that best represents the future you want for your children and future generations. 97% of climate scientists are convinced human-caused climate change is happening. Carbon dioxide (CO2) is a greenhouse gas produced from burning fossil fuels. It’s a primary cause of climate change. Our members of Congress must represent the diversity of views in our 13th district and given the significant risks must take bold steps to find ways to make significant, long-term reductions to CO2 production in the United States. As a government “of the people, by the people and for the people,” Americans expect their members of Congress to represent their views. Please follow our link to your left called "Climate and Pennsylvania" for some information as to the effects of climate change right here in Pennsylvania. Issues like health, outdoor recreation, agriculture, our coast line are covered there. Unfortunately, in most areas the effects are negative. When we burn less fossil fuels and use more clean energy, we clean up our air. We clean up our water. We enjoy better health and healthier economic resources. We can make this happen with market-based solutions that reduce climate risks and grow jobs, grow the economy, and protect public health. Where does your candidate stand on climate change? Our leaders in Congress are in the best position to slow climate change. Know where your candidate stands on climate change—and vote climate!